In order to deal with the problem of wrong and haphazard parking in Mohali city, the district police has come up with a mobile application. 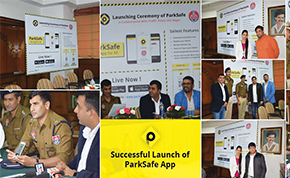 The police launched this app — ParkSafe — that can be downloaded free of charge on iOs and Android phones. The app will help users connect with the vehicle owner who has wrongly parked his vehicle. The user will receive a coded sticker from the traffic police. The sticker once pasted on the vehicle will connect the person scanning the sticker with the owner of the vehicle. The ParkSafe App will provide users with real-time traffic flow information with live updates in traffic alerts section of the application, thereby mitigating inconvenience to the users. It will also have knowledge section wherein users can log in to access traffic rules and signals. The app comprises unique connecting method “Isolated Contact Bridge” technology to connect the users with each other. The app is also equipped with safety feature to help women.